The last three players to sweep an entire week have lost on a Monday. Will five-timer Brennan Bushee suffer the same fate? For the first time, he’s trailing heading into Final – but he has a perfect FJ! record to fall back on. If Brennan doubles his score, he’ll have 23,600. 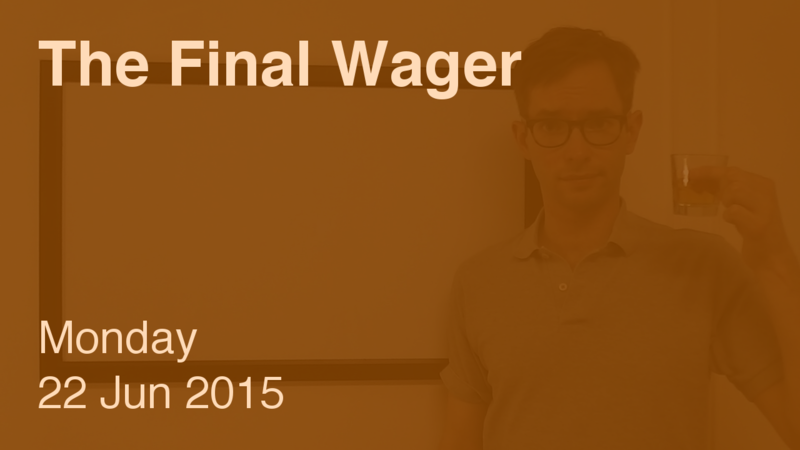 To cover this all-in wager, Kay will need to wager 7,400. An incorrect response with that wager will leave Kay with 8,800. To stay above her total, Brennan can wager up to 3,000. Sacha can wager up to 1,000. A successful doubling will put Sacha at 19,600. To cover this, Brennan should wager at least 7,800. In this case, though, he will lose on an incorrect response, so he might as well wager everything. If Brennan makes the rational maximum wager of 3,000, Kay will need to wager 1,400 to stay above him. In that case, Brennan would have to wager 5,800 and respond correctly. Another vote for the all-in wager. Sacha might consider risking at least 7,800 – in other words, everything. Brennan should cap his lowball wager at 1,000 in case Sacha has a similar idea. Maybe Brennan is a believer in paying it forward – after all, he did get one hell of a gift on Friday’s episode. I do want to point out my Corollary to Rule #2 of my original wagering tutorial: If you must get it right to be in contention, wager everything. In any event, Brennan had a great run, winning $126,404 in his five victories. He’ll be back for the TOC – his six-Final streak still alive. What is “Lost in Space”? I’d like to mention that if Brennan wagers the rational 999, he will have 12799. To stay above this, Kay will have to wager no more than 3400. But she has to wager at least 3400 against Sacha. Thus, it is a wager to tie scenario. On the other hand, practically everything seems to me to be a wager to tie scenario, so we probably shouldn’t go in so deeply. Besides, I tried figuring out and deriving the equation, and ended up (twice!, starting with two different equations) with 3C – 4A = 5B, which obviously makes no sense.